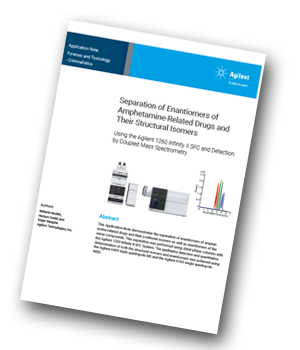 Agilent Technologies has produced an application note demonstrating the separation of enantiomers of amphetamines and their positional isomers on chiral phase columns using SFC with mass spectrometry. The isomeric compounds 4-, 5-, and 6-EAPB are psychedelic drugs structurally related to amphetamine, and belong chemically to the class of benzofuran compounds. The three compounds are structural isomers comprising one chiral center; therefore, each exists in two enantiomeric forms. This application note demonstrates the separation of these structural isomers and their enantiomers by chiral chromatography. This separation was achieved using the Agilent 1260 Infinity II SFC System coupled to mass spectrometry for qualitative and quantitative determination. For a full list of instruments, setup, software, columns, chemicals and samples please download the application note below. A method developed for the chiral separation of D- and L-amphetamine was chosen as the starting point for developing a separation method for the six isomers of 4-, 5-, and 6-EAPB. This method immediately led to a promising separation of all six possible stereoisomers, with all six isomers being partially separated between 2.8 and 6.0 minutes. This separation was then further optimized due to the incomplete separation. This application note demonstrates the use of the Agilent 1260 Infinity II SFC for the separation of either all six possible isomers of 4-, 5-, and 6-EAPB, or the separation of only the three respective structural isomers. The detection and quantitative determination have been done by coupling the SFC either to a single quadrupole or a triple quadrupole MS. The calibration curves for quantitative analysis were performed on the triple quadruple MS and showed excellent linearity (R2 >0.9990) and sensitivity. The LOQs were found at 100 ppt and the LODs at 30 ppt.